mechanisms of P transport, such as runoff and erosion. Maintain soil test P levels near the optimum for crop growth. Risk of loss is greatest when soil test P levels are excessively high. Soil test P is often increased with repeated manure application. Practice conservation tillage or no-tillage to minimize erosion, and therefore, the potential of P delivery. 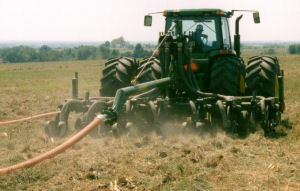 Apply manure when there is a relatively low risk of runoff during the weeks after application. Avoid application on frozen and snow-covered soil as a runoff event may occur with snow-melt. Incorporation of manure may reduce potential for P runoff but may increase the potential loss to erosion. For more see Agricultural Phosphorus Management. Phosphorus transport to surface waters is largely determined by erosion and runoff, distance to concentrated water flow or to surface waters, and by management practices that trap sediments and nutrients carried by runoff and erosion before these enter surface waters. The potential for erosion and runoff are determined by the amount of precipitation and intensity of rainfall events, slope steepness and length, soil type, crops grown, and crop and conservation management practices. Some of the erosion P is readily available to aquatic vegetation and some eventually becomes available. Conservation practices, such as terraces and farm dams, that reduce runoff, erosion and sediment delivery generally reduce P delivery to surface waters. Vegetative filter strips on hillsides and well-placed vegetative buffer zones along streams can be effective in filtering out sediments and some nutrients before they enter surface waters. Most of the P that enters surface waters may come from only 10-20% of the area of a watershed, and especially from areas that are very near to concentrated water flow. Alternative management practices may be needed for these sensitive areas. Lesson 34 in the Livestock and Poultry Environmental Curriculum Phosphorus Management for Agriculture and the Environment addresses land application of manure. Assessing site vulnerability to phosphorus loss in an agricultural watershed is a literature review by Sharpley et al.